The word ‘dance’ generally conjures ideas of human movement used as a form of expression, social interaction or presented in a spiritual or performance setting. The art of dance comes from the ancient times, when it was also used to describe non-verbal means of communicaton between humans. This Spring ECLA students have the opportunity to experience performance dance in the liberal arts setting. ECLA has organized a dance project as an additional student activity sponsored by the office of student life. 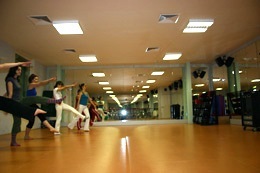 With many interested students, the dance classes will be offered until June 2007. The Pilates and Horton-based dance technique used for the classes trains strength and flexibility as well as developing a sense of balance, rhythm, muscle control and stamina in dancers. While we sharpen our writing and reasoning skills in the lecture hall and seminar groups, the dance classes allow experimentation with other ways of expression. The leader of the classes, Alissa Burmeister, has a rich background in classical ballet and modern dance. She has a minor in modern dance from University of Iowa and had danced with companies in Minnesota, Chicago and Iowa. “The goal of the dance project is to give students an environment to develop their appreciation for dance, both in learning to evaluate movement as viewers and to execute movement as dancers”, says Alissa. None of the participants have previous experience with ballet, or dance for that matter. This makes it a new experience for all, uniting the students in the exciting and challenging activity. The first class started with learning basic dance techniques – the best ways to stretch rarely used muscle groups, isolation of muscles by a conscious distribution of energy and control of breath and various rhythm exercises. Short fragments of dance combinations are already learnt and practiced in class. Hopefully, the elements will come together in a performance with a live ensemble of early music later in the Spring, promising to open up a new venue for an aesthetic pleasure both for the dancers and the audience.